French writer and traveller in both Europe, the Middle East and the Orient. Born in Paris in 1605, where both his father Gabriel [1566-1610] and uncle Melchior [1564-1641], Protestant refugees from Antwerp, were active as engravers, geographers and mapsellers. In these surroundings it is hardly surprising that from an early age, Jean Baptiste Tavernier was inspired to travel. By the age of 16 he had already travelled to England, the Netherlands and Germany. 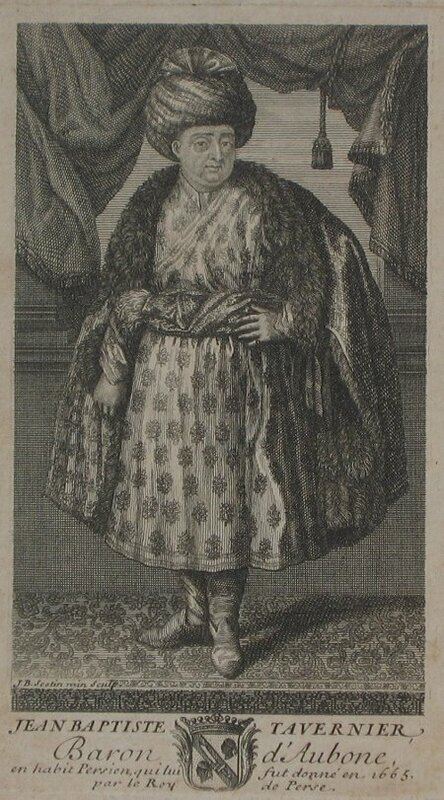 Between 1624 and 1629 he resided in the household of Viceroy of Hungary & in 1630 gained some military experience in the Thirty Years War with Colonel Walter Butler. In 1631 he travelled in the company of 2 French missionaries first to Constantinople and then on to Persia, returning to Paris in 1633. Subsequently he became comptroller of the household of the Duke of Orelans. Between 1638-43 he travelled via Aleppo to Persia and then on to India, reaching as far as Agra and Golconda. He visited the court of the Great Moghul and investigated the diamond mines of India. During one of his several trips to India, probably in 1642, he purchased a 112 3/16-carat, rough-cut dark blue diamond from one of the Golconda diamond mines. He was soon to become rich as an international merchant of jewels, supplying the rich potentates of both Europe and the East with his wares. Between 1643-49 he travelled as far as Java returning via the Cape, but his experience at the hands of the Dutch left him involved in long-standing lawsuit upon his return which he never satisfactorily resolved. His next three voyages in 1651-55, 1657-62, & 1664-68 did not take him further than India. The details of these latter voyages are often obscure but they completed an extraordinary knowledge of the routes of the overland Eastern trade. He recounted these journeys in his famous Six Voyages, also including accounts of Japan and Tonkin, the latter based on correspondence with his brother Daniel who had travelled with him to Java in 1643 and had settled in Batavia. The work was first published in Paris in 1676 and reissued in English  and German . His travels and expertise in diamonds earned him a great fortune and a much vaunted reputation at home in France. In 1668, King Louis XIV purchased from Tavernier the rough blue Golconda diamond for the sum of 22,000 French louis (which equalled 147 kilograms of gold) along with forty-four other large diamonds and 1,122 smaller diamonds. and had what was now known as le bleu de la couronne de France (the blue of the French Crown) recut to 68 carats. It was later reset by Louis XV’s court jeweler in another of the French crown jewels, a pendant known as the Golden Fleece. During the one hundred twenty years in which it remained a French crown jewel, it passed from Louis XIV to Louis XV, and to Louis XV’s grandson, Louis XVI and his wife, Marie Antoinette. During the course of the French Revolution in 1792, the Crown Jewels were stolen and le bleu & the Golden Fleece disappeared. In 1830, a 45.5 carat blue diamond (now called the Hope Diamond) suddenly appeared on the market and some believe that the Hope diamond may have been a recut version of the lost bleu originally purchased by Louis XIV from from Tavernier. After the sale of this signifcant collection to Louis XIV, Tavernier received letters of nobility in 1669, and in the following year purchased the barony of Aubonne, near Geneva. In 1662 he had married Madeleine Goisse, daughter of a Parisian jeweller. After the Revocation of the Edcit of Nantes in 1685 he moved to Germany. He died on his seventh voyage to Russia, in Moscow in 1689. Included in his Six Voyages were important maps of Tonkin and Japan. He is also known for a map of the 13 Swiss Cantons dated 1668.